A camera for the Game Boy that takes four color pictures. The camera itself is built into a rotatable eye on top of the cartridge. At the time of its release, it was the world's smallest digital camera. 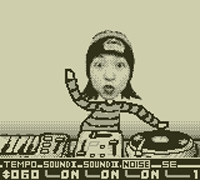 The Game Boy Camera software contains a huge range of camera settings and image editing options. 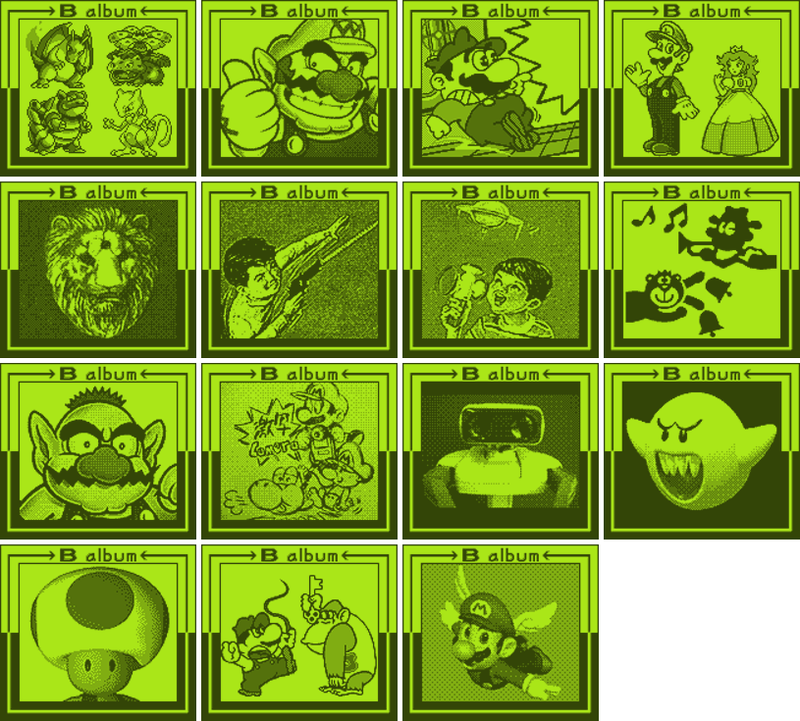 You can also link the Game Boy Camera to the Game Boy Printer and print out your images on special sticker paper. You can also take photos of faces for use in built-in games and other modes. On the title screen, an animated photo montage of someone in a Mario suit dances around. The Japanese version of the game also has a dancing Mario, but the Mario suit is different. From the Main Menu, select View, then Show. The Show Menu is decorated with artwork from the Donkey Kong Jr. arcade machine, including Donkey Kong's face and a growling Snapjaw. 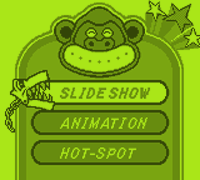 From the Main Menu, press SELECT and choose Doodle. The Doodle Menu background is a model of Luigi from the Mario series. From the Main Menu, press SELECT and choose Link. 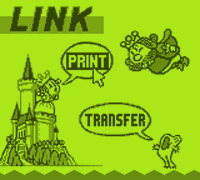 The Link Menu is decorated with the King, Queen and Club Frog from the artwork for 1981 Nintendo arcade game Sky Skipper. From the Main Menu, press SELECT and choose Link. Then from the Link Menu, choose Transfer. 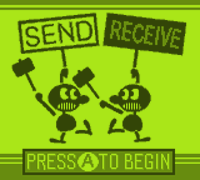 The Transfer Menu is decorated with characters from the Game & Watch game, Judge. When you select an option, the two Judge characters hit each other. From the Main Menu, press SELECT and choose Special. The Special Menu is decorated with a picture of Mario driving a classic car. This image is an old piece of promotional artwork, and does not appear in the Japanese version. When you send or receive a picture with another Game Boy, you have to wait for the information to be transferred. 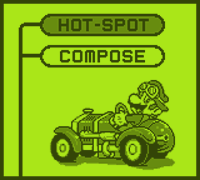 The standby screen features Wario and Peach from the Mario series, and the artwork is taken from Mario Kart 64. This does not appear in the Japanese version. 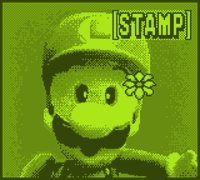 When you send a picture to the Game Boy Printer, you have to wait for the information to be transferred. First, you will briefly see an animated pattern featuring the diver from the Game & Watch game Octopus. 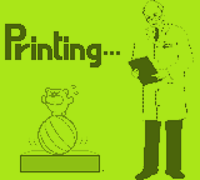 On the Printing screen is Tamanoripu, an enemy from Super Mario Land 2: 6 Golden Coins. 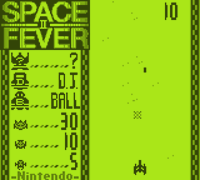 When you choose Play from the Main Menu, you start a game called Space Fever II. When it starts, you can either shoot ships to access the other games, or wait to begin the game. It's a top-down space shooter where you have to take out enemies and avoid their weapons, and then take out the boss - a giant face photo, which you are able to change. The original Space Fever was an early Nintendo arcade game based on Taito's Space Invaders, released in 1979. Begin Space Fever II and shoot the "B" ship to begin the Ball game, based on the first Game & Watch game, Ball, released in 1980. 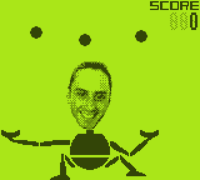 The game is the same as in the original, only you can transfer your own face onto that of the juggling doll. The U.S. 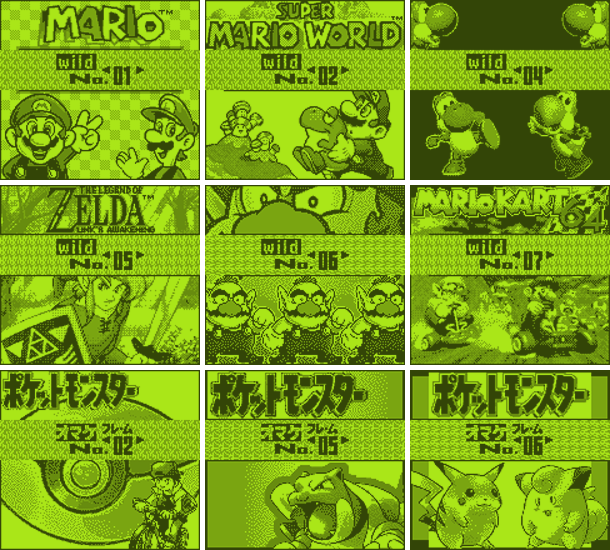 Version features stamp categories for Mario (including Donkey Kong), and Pokémon. It is worth noting that the Game Boy Camera was released before Pokémon in the US and Europe. 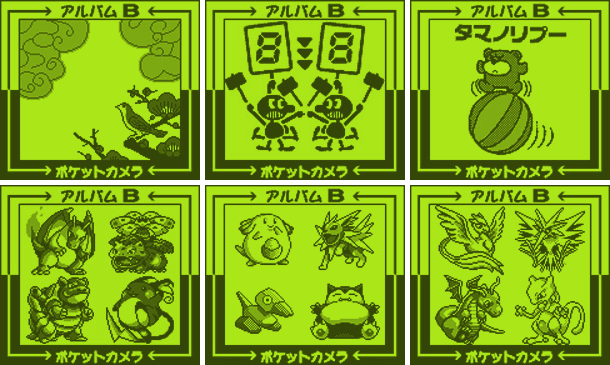 The Japanese version exclusively features sprites from Pokémon: Red & Green as stamps. This special edition includes stamps from The Legend of Zelda series, and more specifically artwork from The Legend of Zelda: Ocarina of Time. When editing a picture, press Right and select Frame to view the standard frames. 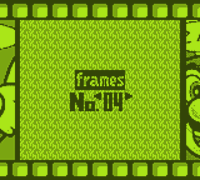 Frame 4 features a Mario design. When editing a picture, press Up and select Print. On the Print screen, press SELECT to get a choice of Exposure or Frames. Choose Frames, then choose Wild. These special "Wild Frames" are much larger than the standard frames. There are differences between the US and Japanese versions. When you check out your album, scroll past the pictures you took yourself and you will find the B-Album. These pre-loaded pictures include several that have to be unlocked. While some pictures are the same between Japanese and US versions, most of the images are different. Only the pictures that are cameos will be listed. B18: Classic Mario artwork from Mario Bros. The Japanese release didn't feature as many cameo pictures in the B Album as the U.S. version, but it also had a few that aren't in the U.S. version. This special edition features all of the B-Album pictures from the U.S. version, plus three more piece of The Legend of Zelda: Ocarina of Time artwork that replace others. On the Main Menu, press START to be taken to the space-themed sub-menu, and choose Credits. If you have completed Run Run Run! 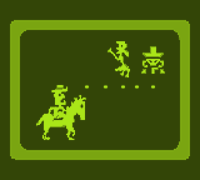 in 22 seconds or less then you will be greeted by a beaming face saying "Clip This" followed by a little animation from Nintendo's 1979 arcade game Sheriff. When the credits start up, the music playing in the background is the Twinkle Elementary School music from Mother, which also appeared as the file Select music from EarthBound. Throughout the game and in the game's Sound Test, several of the songs that appear are Boss themes taken from Balloon Kid. It is worth noting that Balloon Kid was not originally available in Japan, aside from a Hello Kitty port released on the NES by a third party. A Game Boy Color port was released 2 years after the Game Boy Camera.